At UCCS, 80 percent of the student body is classified as commuter students, or students who attend university but do not live on campus. Most commonly, however, commuter students travel for convenience — both logistically and financially. Kaylie De Saussure, a freshman studio art major, has been a commuter student for over a semester and finds commuting to be more affordable than living on campus. “I’m an out-of-state student so being a commuter student is more affordable. I also live so close to campus that I either walk to school, take an Uber or ask someone at home to give me a ride if I’m running late or if the weather is too cold to walk,” said De Saussure. UCCS offers several options for commuter transportation and is actively looking at expanding these options to accommodate students, according to Jim Spice, executive director of Parking and Transportation Services. “We’re constantly looking at the campus masterplan, where demand is and where we need to add more parking. It’s the same with the shuttle service and finding funding to continue the (Mountain Metro) program in the future,” said Spice. UCCS has a partnership with Mountain Metro Transit, Colorado Springs’ bus system. Students can ride the bus to and from campus for free with their student ID. “We’re looking at ways to continue the Metro pass in the future,” said Spice. 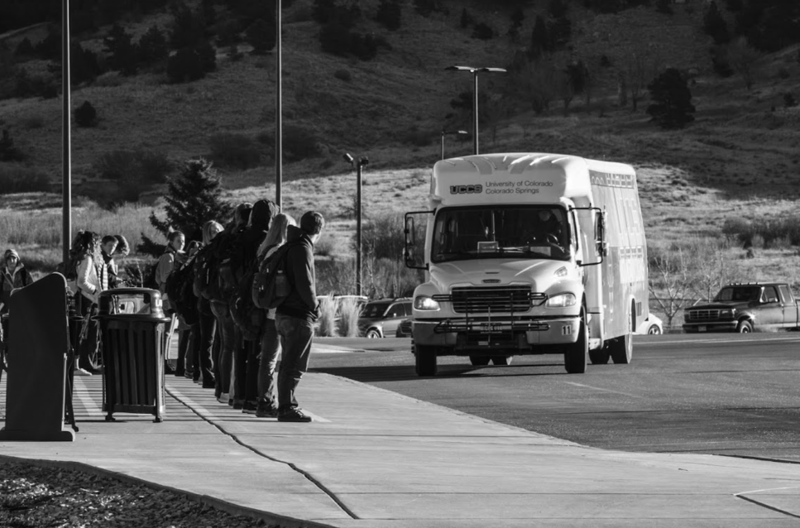 UCCS’ shuttle buses, which are separate from Mountain Metro, also serve as accessible transportation for students and staff, according to Spice. “We have two different routes. One is bringing folks up from lot 576 to Centennial Hall and the other in an internal on-campus route that goes from Alpine village to University Hall,” said Spice. The shuttles have been available to students and staff for almost two decades now, according to Spice. In 1998, when the student referendum for the transportation and safety fee was created, the shuttle bus program was implemented. “We started with one shuttle way back then and now we’ve got twelve,” said Spice. Students, like De Saussure, appreciate the service. “I think (UCCS transportation) is doing a great job right now. Especially now that students can ride the bus for free with their student ID. I appreciate the shuttle bus a lot considering I don’t have a car,” she said. For commuter students wishing to park on campus, they can either pay to park on a daily basis, or purchase permits. According to the UCCS parking and transportation services website, there are 11 different types of permit options for students, ranging in price from $37-$450. Haley Hunsaker, a senior majoring in history, has been a commuter student for over two years and believes the price of these parking passes could be improved. “(Parking passes) are expensive. We could benefit from having more affordable parking passes. I think we have ample parking, but the campus has grown so much, I’m not sure if the parking reflects that,” she said. The price of the permit as well as the fine for a parking citation are used to fund Parking and Transportation Services. According to Spice, the annual budget of $200,000 is used to fund factors such as wages for student employees, maintenance for the parking service vehicles and other aspects that benefit both students and the university. “The thing with ticketing is that any revenue we make beyond what it costs to have an enforcement program goes to a student scholarship at The Family Development Center,” said Spice. For more information on transportation, visit uccs.edu/pts/parking.